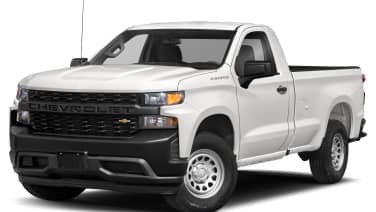 When Chevrolet introduced the redesigned Silverado pickup for 2014, you, our loyal readers, gave the new truck's front-end a lukewarm response. Aside from saying it was ugly, one commenter came to the far more damning conclusion that this brand-new vehicle already looked dated. For 2016, Chevy has attempted to address opinions like that, issuing a comprehensive facelift to its bread-and-butter pickup. Designers cut way back on the chrome for 2016, fitting a body-color strip across the middle of the grille and going to a single-headlight design. Combined with twin LED running lamps, the new look is much more modern while still harkening back to the retro-ish look introduced a few years back. The new truck also gets a much more muscular and aggressive hood, while the front bumper is significantly more modern, and features vertical housings for what look like LED foglights. The bad news, here, is that there's only one picture, shown above. We have no idea what changes Chevy has made to the rear of the pickup, nor do we know what other versions of the truck beyond the Z71 seen here may be available. The Bowtie brand did, however, confirm that we'd see a wider application of the eight-speed automatic transmission, as well as a new version of the MyLink infotainment system, which will play nice with both Apple CarPlay and Android Auto. Look for much more on the freshened Silverado when it makes its official debut this fall. Until then, check out the press release and hop into Comments. We'd love to hear what you think about this facelift. DETROIT – Chevy Trucks are on a roll, with Chevrolet pickup sales up 32 percent so far this year. Chevrolet intends to strengthen this momentum with significant updates for the 2016 Silverado 1500 full-size pickup. "The redesigned 2016 Silverado will build on Chevy Trucks' legacy of dependability. It will feature a more muscular appearance and offer new customer-focused technologies," said Sandor Piszar, marketing director for Chevy Trucks. "New front end designs with bold horizontal elements, sculpted hoods and dramatic lighting reflect the strength and refinement that have helped make Silverado the fastest growing full-size pickup brand this year." The redesign of the 2016 Silverado 1500 is part of an aggressive strategy to build on Chevy Trucks' momentum.